I’d much rather bake my pancakes than flip them. Wouldn’t we all rather be sitting on the couch drinking coffee than babysitting pancakes on the stove. 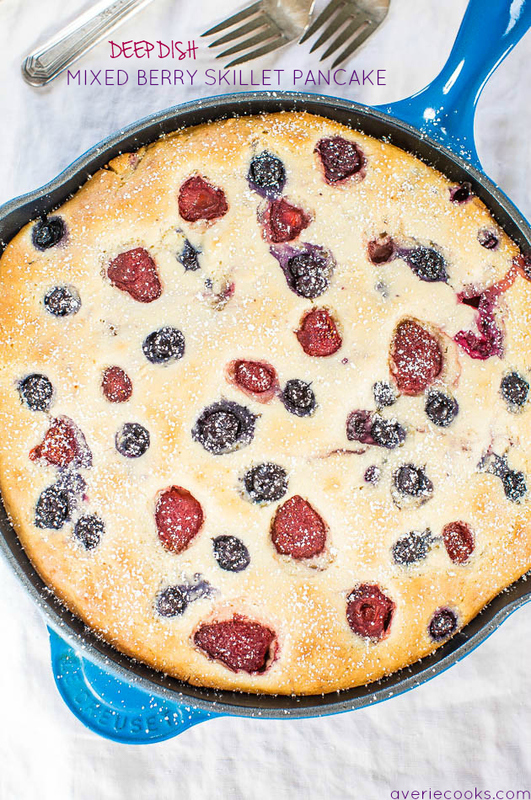 If you love thick stacks of pancakes, you’re going to love this deep-dish skillet pancake. 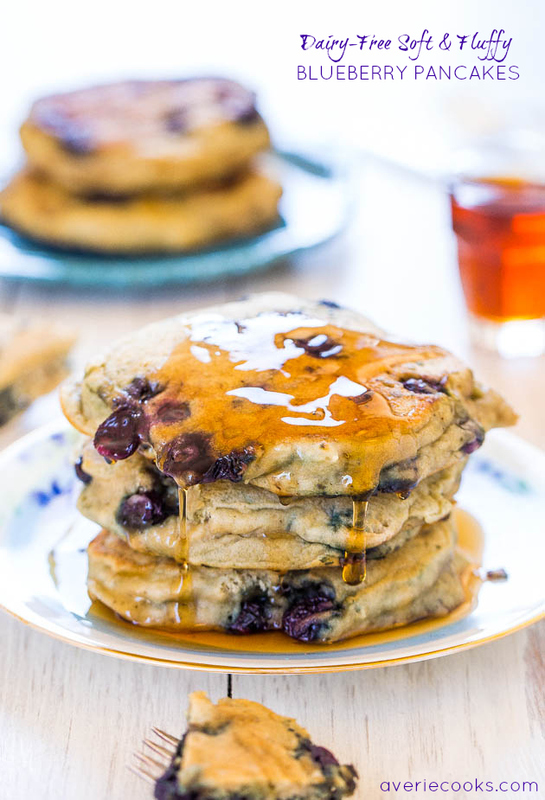 It’s soft, fluffy, and light, with the texture of pancakes, and it’s packed with berries. It’s an absolutely perfect brunch recipe because it feeds a crowd and you can pop it into the oven about 45 minutes before you’re ready to serve it. The easy, stir-together recipe comes together in minutes with ingredients you likely have on hand. A bowl of bowl of dry ingredients, a bowl of wet ingredients, with (frozen) mixed berries. I used frozen fruit because it’s cheaper and I always have it on hand, but use fresh if preferred. Baking time will be reduced with fresh, but I can’t say by how much. 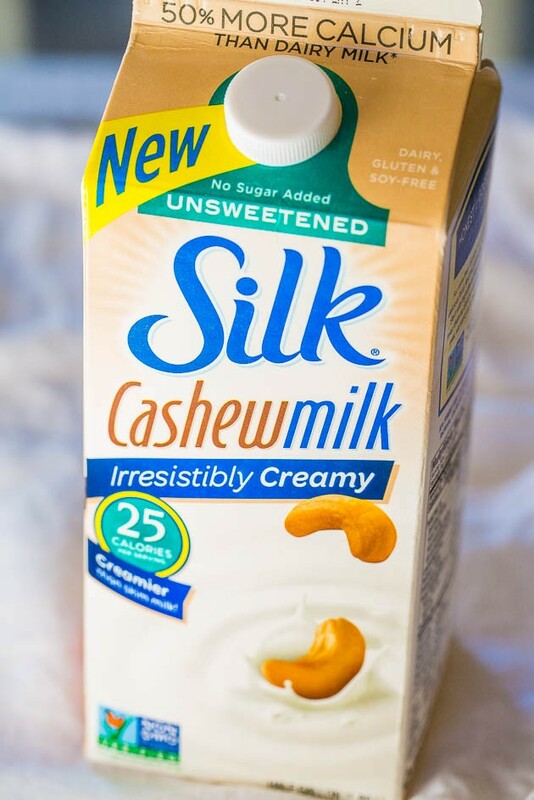 I used Silk Unsweetened Cashewmilk and it’s so irresistibly creamy but with fewer calories than skim milk. Silk Cashewmilk or Silk Almond Milk are my milks of choice for baking and smoothies because they’re so low in calories and fat, they’re vegan and dairy-free, and I always get impressive-tasting results. It’s the perfect match between tasty and guilt-free. I used my Le Creuset Enameled Cast-Iron 10-1/4-Inch Skillet but most any heavy-bottomed, oven-safe skillet will be fine. Make sure it’s a solid 10-inches because when the pancake rose in the oven, it used up every inch of my skillet and you don’t want an overflow. I made this for my family and we had plenty left over. I wrapped individually-portioned wedges in plasticwrap for quick, easy, grab-and-go weekday breakfasts for my daughter. I’d much rather bake my pancakes than flip them. If you love thick stacks of pancakes, you’re going to love this deep-dish skillet pancake. It’s soft, fluffy, and light, with the texture of pancakes, and it’s packed with berries. 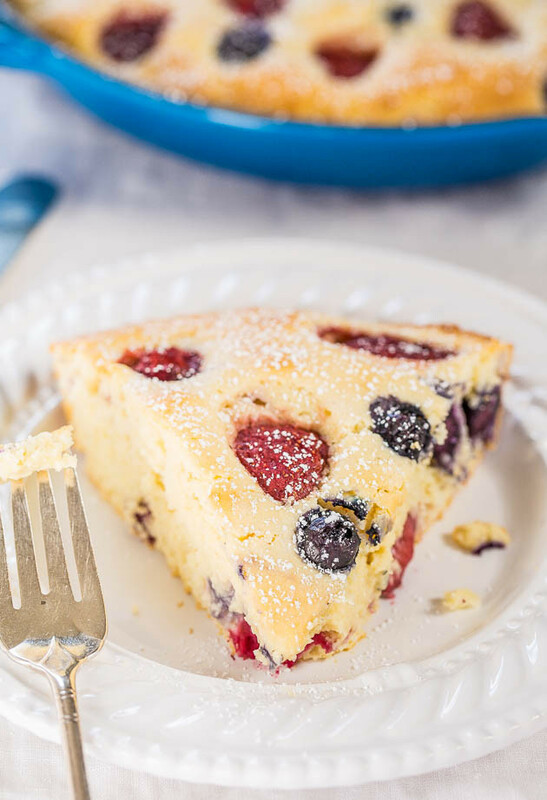 It’s a perfect brunch recipe because it feeds a crowd and you can pop it into the oven about 45 minutes before you’re ready to serve it.I used frozen fruit because it’s cheaper and I always have it, but use fresh if preferred. Most any heavy-bottomed, oven-safe skillet will be fine but make sure it’s a solid 10-inches to prevent overflow. Extras can be wrapped individually for quick, easy, grab-and-go weekday breakfasts. Preheat oven to 375F and spray a large 10-1/4 inch cast iron skillet or oven-safe skillet with cooking spray if skillet isn’t well-seasoned. Make sure skillet is at least 10-1/4 inches; 12-inch skillet is okay noting pancake will be thinner and baking time will be reduced; set aside. To a large bowl, add the flour, granulated sugar, baking powder, salt, and whisk to combine; set aside. To a medium bowl, add the eggs, milk, sour cream, oil, and whisk to combine. Pour wet ingredients over dry, stirring until just combined; don’t overmix. Some lumps may be present and this is okay; don’t try to stir them smooth. Gently stir in the fruit. Turn batter out into prepared skillet, smoothing the top lightly with a spatual if needed. Tip – add a few extra berries to the top for visual appeal. Bake for about 45 minutes, or until pancake is cooked through in the center. 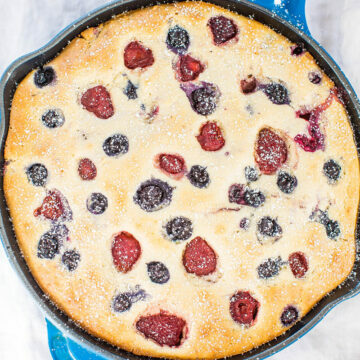 Baking times could range dramatically based on type of skillet used and if fresh or frozen berries were used. Bake until your pancake is done given your variables and watch your pancake, not the clock, when evaluating doneness. Optionally dust with confectioners’ sugar, slice, and serve with maple syrup. Pancake is best fresh but extra can be wrapped individually in plasticwrap and will keep airtight in the fridge for up to 5 days; reheat gently in the micro before serving. 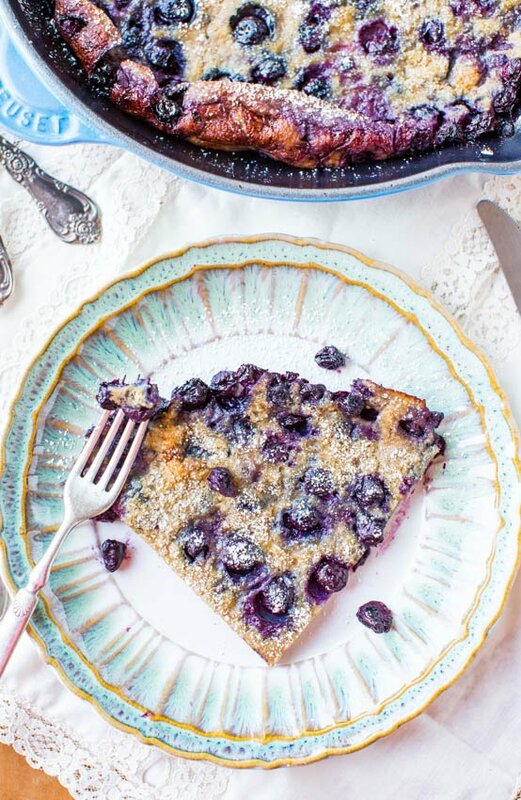 Blueberry Dutch Baby Pancake – This big, fluffy, light pancake is so easy and packed with blueberries! 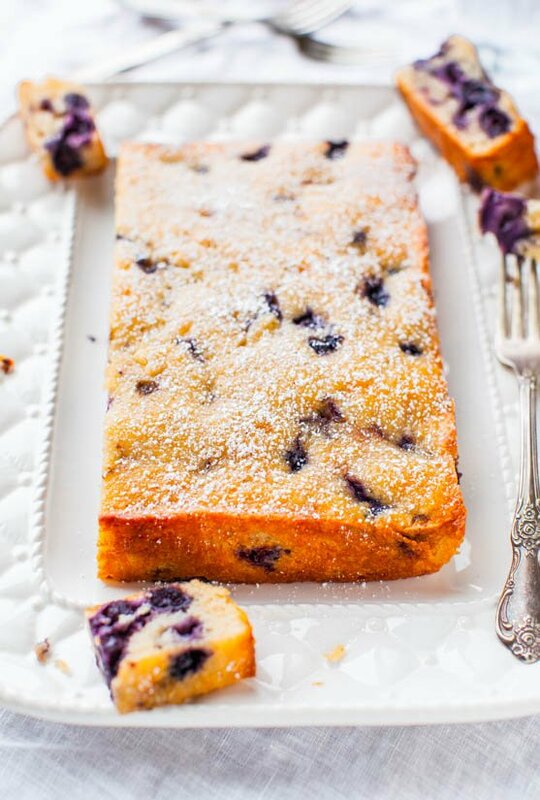 Blueberry Muffin and Buttermilk Pancakes Cake – A cake that tastes like a cross between soft blueberry muffins and fluffy buttermilk pancakes! 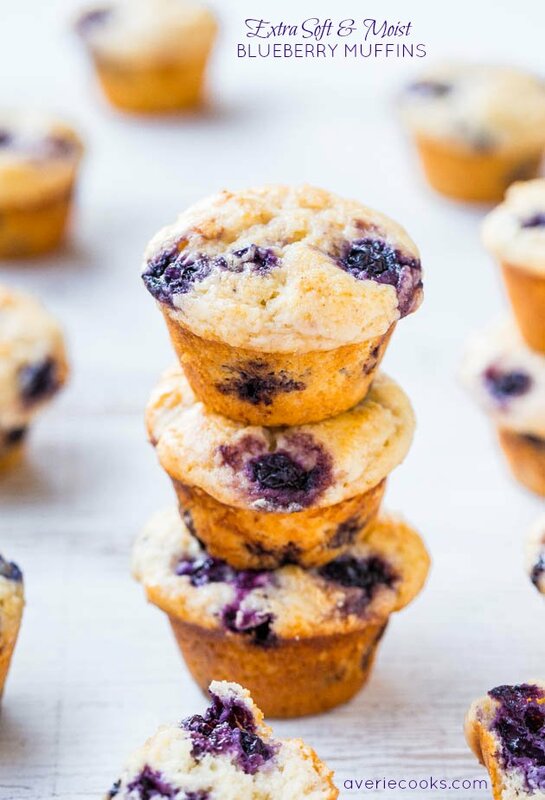 Extra Soft and Moist Blueberry Muffins – Supremely soft, moist, and packed with berries! 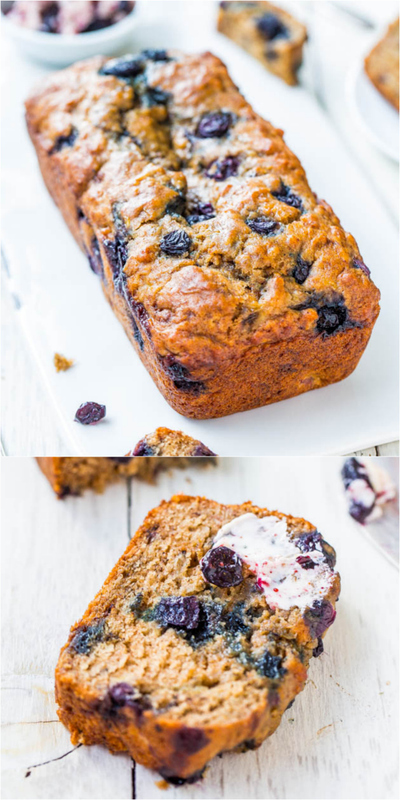 Brown Sugar Blueberry Banana Bread with Blueberry Butter – Banana bread made with blueberries is a fun twist on the usual! 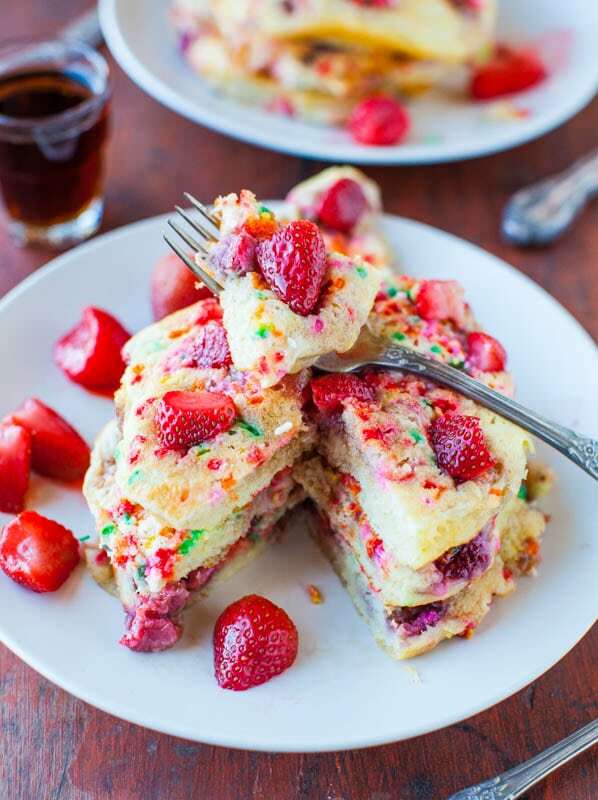 Strawberry and Sprinkles Buttermilk Pancakes – Jazz up your usual buttermilk pancakes by adding strawberries and sprinkles make everything more fun! 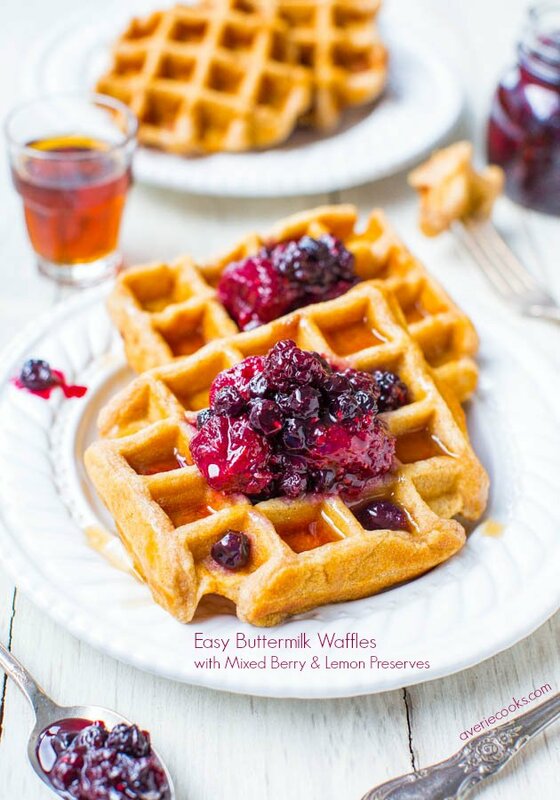 Easy Buttermilk Waffles with Mixed Berry & Lemon Preserves – As fast and easy as using boxed pancake mix, but so much better! Crispy on the outside and soft & fluffy inside! Post is brought to you by Silk. The recipe, images, text, and opinions are my own. Wow, that looks fantastic. And just the ticket for me. I accidentally I knocked my electric griddle off the counter and broke it earlier this week and I’ve been craving pancakes! Yes. Just yes. I hate standing over the stove while everyone else gets to eat nice, hot pancakes; then when I finally get to sit at the table, everyone has disappeared — leaving me to eat alone AND do the dishes. No fun! And the fact that this has lots of fruit too? Count me in! Oh, my goodness…I hate standing there flipping pancakes!!! A pancake skillet sounds so perfect and easy!!! I definitely have to try this!!! And it’s the perfect recipe for you because it makes a lot and all your kids could go hog wild on it, and you would hardly have to lift a finger because it’s SO EASY! Looks good Averie! I recently got a carton of that cashew milk for my morning oatmeal. It’s tasty! Beautiful, can’t wait to make it! Wow! These look amazing! How would I be able to veganize these? For the egg I know I can substitute it for chia seeds or banana. But what about the Greek yogurt? I haven’t tried so not sure what you’d what to do exactly…they do make vegan yogurt though! Never ever considered baking a pancake – absolutely delicious and a super idea. Thanks so much for this recipe. I was looking for something I could make for out-of-town familyy coming next month – first house guests in my new home. I used blueberries & baked it in a Pyrex pie plate. Fabulous! Thanks for trying the recipe and I’m glad it came out great for you and that it worked well in Pyrex! An update – I’ve started making this pancake on weekends & cutting it into 6 wedges. It gives me breakfast to take to work all week with a couple of microwavable sausages. So easy & good! That’s great to hear and love the tip you shared! I recall when I made this that I had accidental (but happy-accident) leftovers for breakfasts for my daughter for the next few mornings before school! Thanks for trying the bread recipe and I’m glad it came out great for you! With GF flour and with various fruit combos. Great idea to pre-make the night before and then just re-warm a bit! I really have no idea and wouldn’t want to give you incorrect info just by guessing since it’s very important for the child. Is it possible to do this without the yogurt/sour cream? I’ve only made it with the sour cream/yogurt so can’t say for sure what will happen if you omit it. I suggest addiua teaspoon vanilla extract. This recipe also works well subbed by half the flour with almond flour for extra fiber and protein. Thanks for the five star review and I’m glad that half almond flour worked well for you.